Free Shipping Included! Roundhill Furniture Saillans Solid Wood Construction Fully Assembled Dresser and Mirror, Cherry Finish by Roundhill Furniture at Indsight. MPN: B030DM. Hurry! Limited time offer. Offer valid only while supplies last. Give your bedroom a stylish makeover with the elegant Solid Wood Construction Dresser & Mirror. It is beautifully crafted of Solid Wood Construction. 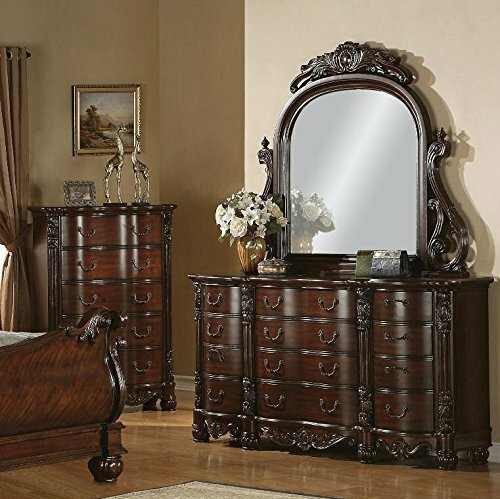 Give your bedroom a stylish makeover with the elegant Solid Wood Construction Dresser & Mirror. It is beautifully crafted of Solid Wood Construction. Superior construction comes in the form of spacious drawers with metal guides. Antique-brass drawer pulls further enhance the stately, traditional style. The opulent cherry color flows beautifully over the decorative pilasters and ornate detailed appliques in the corners. It combines traditional design and exquisite details perfectly and ultimately create this grand French style.